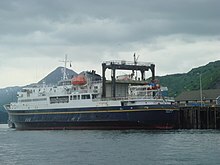 Kodiak ( Alutiiq: Sun'aq; Russian: Кадьяк, tr. 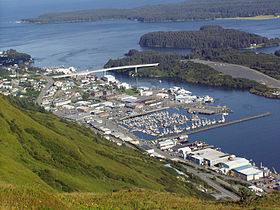 Kadʹyak) is one of seven communities and the main city on Kodiak Island, Kodiak Island Borough, in the U.S. state of Alaska. All commercial transportation between the entire island and the outside world goes through this city either via ferryboat or airline. 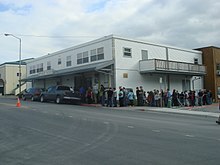 The population was 6,130 as of the 2010 census. 2014 estimates put the population at 6,304. The Kodiak Archipelago has been home to the Alutiiq for over 7,000 years. [ citation needed] In their language, qikertaq means "island". 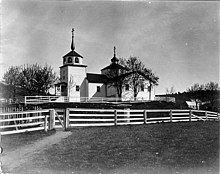 In 1763, the Russian explorer Stephan Glotov discovered the island, calling it Kad’yak (Кадьяк). He was followed by the British captain James Cook fifteen years later, who first recorded "Kodiak" in his journals in 1778. Kodiak has a subarctic climate ( Köppen Dfc) that very closely borders a humid continental climate (Dfb) marked by chilly to cold weather year-round. Precipitation is heavy year-round, though markedly less in the summer months. ^ 1996 Alaska Municipal Officials Directory. Juneau: Alaska Municipal League/ Alaska Department of Community and Regional Affairs. January 1996. p. 84. ^ "American Factfinder" ( CSV). United States Census Bureau. 2009-03-18. Retrieved 2011-07-07. ^ Huisman, Jan (November 28, 2008). "Navy SEALs Find Ideal Training Grounds In Kodiak". Fairbanks Daily News-Miner. Retrieved 2008-11-30. [ permanent dead link] United States Navy, Naval Special Warfare Public Affairs (March 21, 2007). "Cold Warfare: Future SEALs Get a Firsthand Lesson in Northern Exposure" (U.S. Navy press release). GlobalSecurity.org. Retrieved 2008-11-30. ^ " Our Schools." Kodiak Island Borough School District. Retrieved on February 15, 2017.